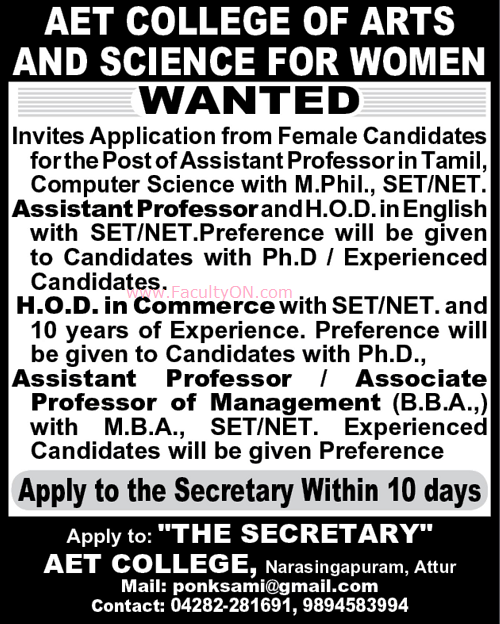 AET College Arts and Science for Women, Salem has advertised for recruitment of Teaching Faculty- Associate Professor / Assistant Professor / HOD jobs vacancies. Interested and eligible job aspirants are requested to apply within 10 days from 25th November 2018. Check out further more details below. About College: A Group of few dedicated retired Teachers, Head masters, Businessman, Engineers, a Principal and Agriculturist joined together to establish the Attur Educational and Charitable Trust in the year 2002, with the aim of starting an Arts & Science College in Attur. Though all the formalities for starting the college were fulfilled in the year 2002 itself, the dream has come true only during the year 2005-2006 by getting the approval from the Government of Tamilnadu and Affiliated to Periyar University.